"The possibility of modifying the electronic structure of single molecules and their magnetic properties has been of interest to researchers for several decades because of its great application potential. Switching from one magnetic state to another is, with respect to the small size of molecules, an important step towards developing molecular computers," said Pavel Jelinek from the RCPTM and FZU. Molecular switches also offer applications in nanoelectronics, biology, and medicine. Not only are the electrical, optical, and magnetic properties of molecules determined by the arrangement of electrons, which move around in orbitals, but also their biological activity. Molecules with orbitals containing only one unpaired electron possess magnetic properties. However, molecules containing two paired electrons in each orbital are non-magnetic. "Common practice is to induce the switching process by employing environmental stimuli, which is technologically demanding. Instead, we employed an atomically thin layer of graphite, known as graphene, and intentionally replaced some of the carbons in the structure with nitrogen atoms. By changing the lateral position of molecules on the surface using a scanning probe, we were able to reversibly switch from one magnetic state on pure graphene to non-magnetic states in the area of nitrogen atoms. 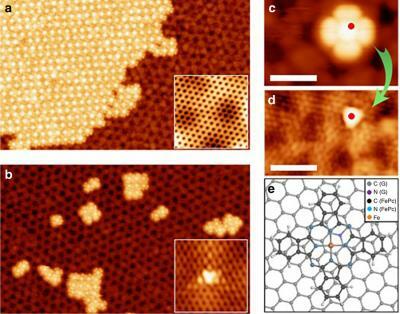 Moreover, we observed changes in the arrangement of electrons in a molecule by atomic force microscopy. This represents considerable possibilities for the scanning probe microscopy resolution," said Pavel Jelinek. Generally, the properties of molecules can be tuned by covalent chemical modification, leading to alteration of the molecular constitution, i.e. termination of old and formation of new chemical bonds within the molecule. These strong interactions involve sharing of electrons that participate in the chemical bond. However, this approach is not applicable for developing molecular switches as the chemical modification usually induces irreversible alteration. Therefore, Czech scientists have attempted to employ weak non-covalent interactions despite the fact that such a strategy has never been contemplated before. "It has been shown that use of cyclic planar molecules based on porphyrin with an iron atom in the center leads to rearrangement of the electrons when the molecule is located in the vicinity of a nitrogen defect in graphene. Using a combination of theoretical calculations and experimental measurements, we confirmed that the non-covalent interaction between the iron atoms and the nitrogen atoms is strong enough to disturb the magnetic state of the molecule but, at the same time, too weak to allow transition of the molecule back to the magnetic state as soon as the molecule is returned to a pristine graphene surface," said Pavel Hobza, a world-renowned expert on non-covalent interactions from the RCPTM and IOCB. This new way of controlling molecule properties without changing the chemical structure irreversibly offers a gateway to other potential applications. "The electronic structure influences not only the magnetic but also the optical, catalytic, electrical, and biological properties of molecules. Such chemically modified graphene may open new doors for developing novel optical sensors, photoluminescent materials, catalysts, and pharmaceuticals" said Radek Zboril, RCPTM Director.